A gold bangle bracelet adds style to an ensemble, and a wide statement bracelet made of gold can catch the eye in an instant. When you're hunting for the perfect gold bangle to serve as a statement piece, you'll quickly find that pieces that are high quality with rich color can run in the thousands, leaving you with the choice of settling for a lower purity and less color or a smaller bangle design that what you had hoped. 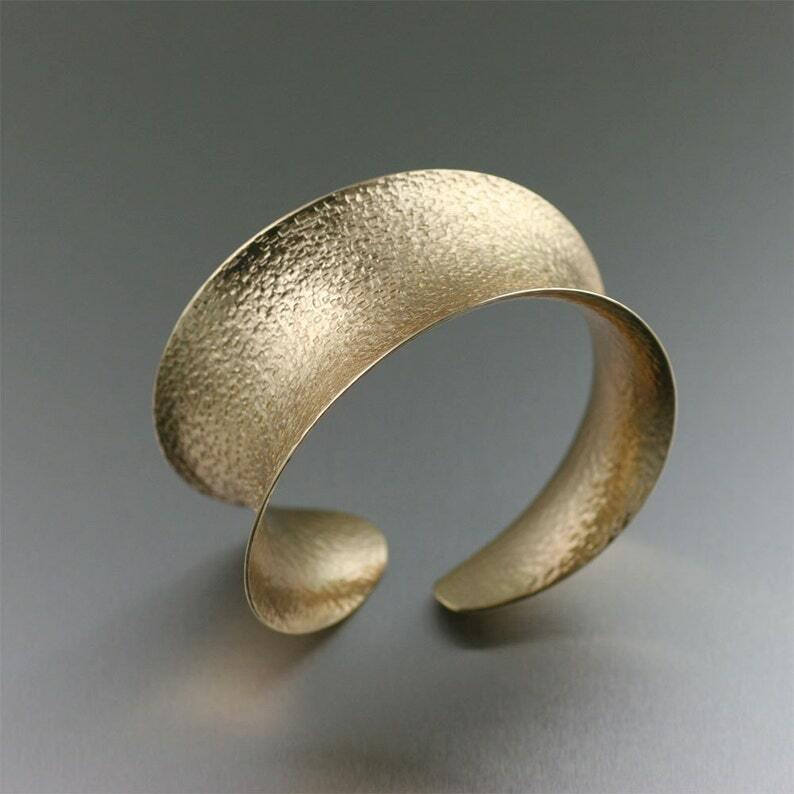 The Texturized Nu Gold Anticlastic Bangle Bracelet is the better option, as it gives you a wide, chunky look for a very low price. Instead of genuine gold, the Texturized Nu Gold Anticlastic Bangle Bracelet is made from red brass, a material so vibrant in hue that it's called Nu Gold. The anticlastic folding and hand texturing of the piece give it a vibrant shine for a bold impression every time you wear it. The brass has a clear coating to guard against tarnish. - Available in 4 circumference sizes. Pretty earrings for a special occasion. They were the perfect size for me. Love them! Purchased this for a wedding and it provided just the right amount of classy gleam. Very well made and it was a treat to have a cuff bracelet that doesn’t fall off for once! Thanks, JSB! Chased Anticlastic Copper Bangle Bracelet - Rose Gold-Tone Bangle - Makes a Great 7th Anniversary Gift! Bark Anticlastic Copper Bangle Bracelet - Rose Gold-Tone Bangle - Makes a Great 7th Anniversary Gift!